Properties in Kraków average 4.4 out of 5 stars. Property 1: Irena and Anatol Apartment - 5 min walk to Krakow’s Main Square! Sleeps 4! Property 3: WAWELOVE spacious 3 bedroom apt 1 min to Main Sqare! Wawrzynca 19, perfect location in trendy Kazimierz, Garage, AC, Lift etc. Property 14: Wawrzynca 19, perfect location in trendy Kazimierz, Garage, AC, Lift etc. Property 16: Emeryk Apartment - quiet oasis in the city centre. A spacious apartment located in the city center of Krakow! Property 19: A spacious apartment located in the city center of Krakow! Viva Las Vegas apartment in Stare Miasto with WiFi. Property 20: Viva Las Vegas apartment in Stare Miasto with WiFi. Property 25: Apartment near Main Railway Station, close to the Trade and Market Square. 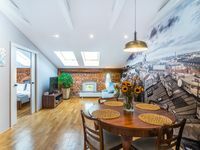 Property 30: Beautiful Apartment in the Heart of Krakow! Exclusive Apartment in the centre of Cracow, 5 minutes from Main Station. Property 40: Exclusive Apartment in the centre of Cracow, 5 minutes from Main Station. Krakus Apartment 400m from Main Market ! Property 47: Krakus Apartment 400m from Main Market ! The host, Paul was very friendly and helpful. Apartment is very clean and well kept. Close to tram, bus etc. Easy walk to Town center. Next time I&rsquo;m in Karkow I know where I&rsquo;ll be staying. Thank you. Pawel&rsquo;s apartment is perfect! He is so warm and friendly and always happy to answer questions. He even provided us with a printed copy of the bus schedule to get to Auschwitz. He had &ldquo;welcome&rdquo; beer and water in the fridge and coffee and tea too! The space is clean, quiet, and light. The location is accessible to everything. You will not be disappointed! We loved it!